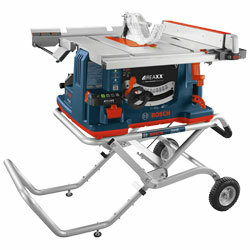 More Info | BOSCH REAXX™ Jobsite Table Saw Product PageLearn more about Bosch's REAXX table saw. The BOSCH REAXX™ Jobsite Table Saw (GTS1041REAXX) is built with Bosch's advanced Active Response Technology platform to help reduce the risk of injury to users by combining advanced Bosch sensors and electronics with mechanical injury-prevention systems. The REAXX™ table saw detects human flesh that comes in contact with the blade and rapidly drops the saw blade below the tabletop. This high-speed blade drop helps to mitigate the potential of serious user injury and occurs without damaging the blade. After activation, the system can be reset in less than 60 seconds. A dual-activation cartridge enables two incidents before a replacement cartridge is needed. So what does the REAXX™ Jobsite Table Saw do? The REAXX™ saw utilizes Bosch's Active Response Technology™ which imparts a low-voltage electrical signal onto the blade in order to drop the blade away from the user. The system is built NOT to damage the blade. The electric signal transmitted by the Bosch Active Response Technology™ alters upon contact with user's skin, triggering a chemical reaction in an activation cylinder (one of the two metal cylinders that is housed in a dual-activation cartridge unit). This action is similar to the deployment of an air bag in an automobile. In this case, instead of deploying an airbag, the chemical reaction fires a piston that pushes against the drop arm. This action rapidly drops the saw blade below the table surface of the saw away from the operator. The drop arm lock retains the drop arm under the table after activation, while the blade is allowed to coast to a stop under the table. After activation, the system needs to be reset. This is a quick reset that can happen in under 60 seconds. All necessary parts and instructions, including push stick and wrenches, are located onboard the saw. The complexity of the Bosch REAXX™ onboard control system is translated to an intuitive, easy-to-understand LED light panel that manages saw operation and status. 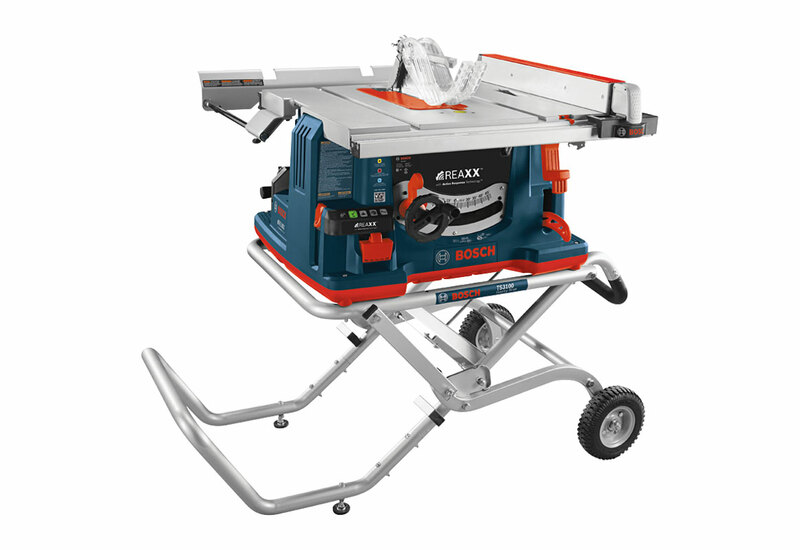 ELECTRIC - The REAXX™ Jobsite Table Saw is built with Bosch's advanced Active Response Technology platform to help reduce the risk of injury to users by combining advanced Bosch sensors and electronics with mechanical injury-prevention systems.